Guy Carawan's music had a message and his songs became the unofficial anthems of the Civil Rights movement. Guy Carawan, who introduced the song “We Shall Overcome” to the civil rights movement, died on May 4 at age eighty-seven after a lengthy illness. 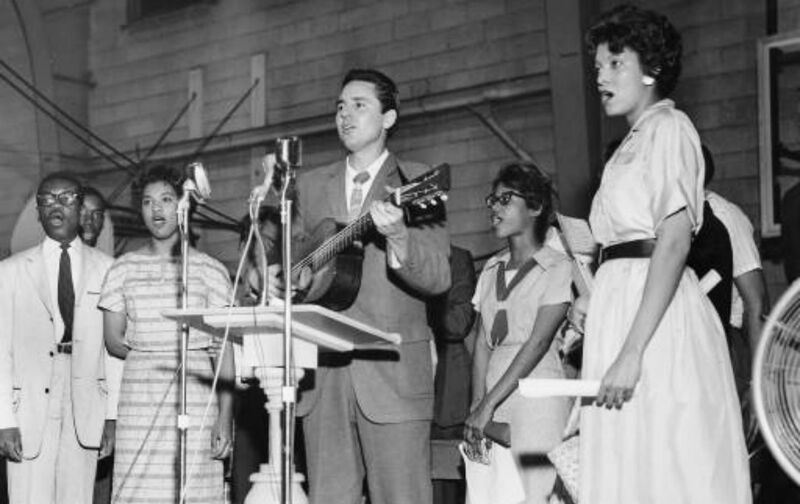 Millions of people around the world have sung the words to ‘We Shall Overcome,” but few of them know the name Guy Carawan. Possessed with prodigious talent and a deep passion for justice, Carawan was modest and self-effacing, and little-known outside of a small circle of social activists and folklore enthusiasts. Of course, that’s part of the folk tradition. Carawan didn’t write “We Shall Overcome,” but he transformed it, turning it into an international anthem for human rights. I had long been a fan of Carawan, who for over fifty years worked as the music director for the Highlander Research and Education Center in rural Tennessee, an interracial training center for grassroots activists, including Rev. Martin Luther King, Rosa Parks, Fannie Lou Hamer, and John Lewis—but until 2000 I didn’t know he had attended Occidental College, where I teach, when I read an article about him in Sing Out, the folk song magazine. I called his home in New Market, Tennessee near the Highlander Center, and asked him and his wife Candie if they’d be interested in doing a concert at his alma mater. Although the Carawans, both originally from Southern California, had occasionally traveled to the area to visit family members, Guy hadn’t been back to the campus since he graduated, with a degree in mathematics, in 1949. He was grateful for the invitation. It took several years to orchestrate the visit, but in March 2003, Guy and Candie arrived on campus. In the meantime, I had persuaded the college president and trustees to give Guy an honorary degree for his lifetime commitment to social justice and his immense contributions to music and folklore. It was pouring heavily that night but by the time the Carawans entered the chapel it was standing-room-only, filled with college students, local activists, and many friends that Guy had made in LA’s folk music scene in the 1950s. One of them was Beth Lomax Hawes, an original member of the Almanac Singers with Pete Seeger and Woody Guthrie. Guy and Candy were joined on stage by their son Evan, an accomplished hammer dulcimer player, and by Simeon Pillich, a world-renowned bass player who teaches at the college. In between sets, Occidental president Ted Mitchell (now deputy secretary of the US Department of Education) bestowed Carawan with his honorary degree. Guy was proud of the honor but somewhat embarrassed by the ceremony—especially when Mitchell placed Occidental black-and-orange hood around his neck—but he kept it on during the second set. During his visit to Occidental, Guy recalled his personal, political, and music journey. Born in Los Angeles in 1927 to parents with Southern roots, Carawan was drawn to folk music after taking a folklore course at Occidental. His interest grew when his mother gave him copies of Carl Sandburg’s The New American Songbag, and musicologist Alan Lomax’s Folksongs: USA. He listened to records by Woody Guthrie, Pete Seeger and Burl Ives. By the time Carawan arrived at UCLA—where he earned a master’s degree in sociology—his curiosity about society and culture had grown considerably. In 1953, Carawan joined folk singers Ramblin’ Jack Elliott and Frank Hamilton and struck out on the road, performing as the Dusty Road Boys. They stopped for a few weeks at Highlander (then in Monteagle, Tenn.), where Carawan got his first exposure to the burgeoning civil rights movement and the importance of songs to the struggle. The folk music boom was just beginning, and Guy hoped to make a living playing music. In 1958, he played the opening night of LA’s legendary folk club the Ash Grove. Later that year, he embarked on a world tour, where he caught the attention of the flourishing British folk scene. In England, he recorded “America at Play” with Peggy Seeger, an album largely composed of songs collected by Alan and John Lomax and Cecil Sharp. Carawan played guitar, banjo and hammer dulcimer. When he returned to the US, he traveled to Highlander to volunteer his services, and soon became its music director. The civil rights movement was underway and Highlander was at the center of it. Founded in 1932 by Myles Horton, an educator and minister who believed in the “social gospel,” Highlander sponsored interracial workshops for labor and civil rights activists. Southern segregationists branded Highlander as a “communist” operation and tried several times to shut it down. Two years later, several of the union’s activists brought the song to Highlander, Zilphia Horton, Myles’ wife and then Highlander’s music director, learned the song from the tobacco workers and included it in all of her workshops. In 1947, she taught it to folksinger Peter Seeger, who was a frequent visitor to Highlander. Seeger made a few changes to the tune, including turning “We Will Overcome” to “We Shall Overcome. It was at Highlander that Carawan first heard Seeger’s version of the famous song. Carawan made his own changes to the tune. He showed Occidental’s students how he had fastened the tempo and revised some words, making it easier to sing in large groups. Carawan started strumming his guitar, then began singing in a firm voice that belied his age. Students recognized the familiar song and started singing along. Then Candie, singing harmony, joined in. After a few stanzas, Carawan paused and told a story. The Southern sit-ins, led by college students, had begun in Greensboro, North Carolina in February 1960. During a weekend workshop at Highlander, Carawan taught his new version of “We Shall Overcome” to leaders of the Nashville sit-in. A few weeks later, he taught the song to more than 300 activists at the historic founding meeting of the Student Nonviolent Coordinating Committee (SNCC) at Shaw University in Raleigh, NC. They were preparing to launch sit-in demonstrations throughout the South, and they spread the song that became the anthem of the civil rights movement. While based at Highlander, Guy pursued a career as a folklorist, a teacher, and a live performer at nightclubs, college campuses, and public rallies for social change. But his ties to Highlander and the freedom movement, his marriage to Candie (whom he met during a civil rights protest in 1960 when she was a Pomona College student spending a year as an exchange student at Fisk University in Nashville), and their growing family—kept him in the South. The Carawans spent several years on the South Carolina Sea Islands, where they helped civil rights icon Septima Clark teach songs to the islands’ rich Gullah culture. In the 1970s, the Carawans immersed themselves in the Black Lung movement, the anti-strip-mine movement, and other regional issues, facilitating workshops for activists, teaching them songs to energize the movement, and documenting, through books and records, the culture of Appalachia and the civil rights movement. The Carawans’ books on the civil rights movement include Sing for Freedom: The Story of the Civil Rights Movement Through Its Songs; Freedom Is a Constant Struggle; and We Shall Overcome: Songs of the Southern Freedom Movement. They also wrote Voices from the Mountains: The People of Appalachia and Ain’t You Got a Right to the Tree of Life? : The People of Johns Island, South Carolina—Their Faces, Their Words and Their Songs. In addition to his own recordings and folkloric collections, the Carawans recorded several albums with their son Evan, including “Appalachian Irish Tunes on Hammer Dulcimer” and “Home Brew.” Carawan also produced albums for other performers (including the Stanley Brothers), written songs recorded by other performers (including Peter, Paul and Mary), and played guitar on albums for other performers and producers (including Alan Lomax). A documentary film by the Carawans’ daughter, Heather, “The Telling Takes Me Home,” recounts her growing up at Highlander in a family and community of activists.